There has been much speculation during the course of the year that Apple would implement the facial recognition technology, which it dropped a lot of cash to acquire in the fall of last year from Swedish algorithm specialist Polar Rose, to the eventual fifth iPhone. Now it appears that the technology will be implemented across the board to all iOS 5 compatible devices and what’s more, it seems as though Apple isn’t just planning on utilizing technology to power a single feature. Instead, it will release it as an open API to app developers, bringing easy integration of face recognition to the apps on the App Store and opening the door to possible Kinect-like interaction. Apple has already rolled out the technology on OS X Lion through Photo Booth, allowing Mac users to manipulate photos into all manner of creations. Such technology is available in many photography applications through third party developers, but Apple being Apple, it will surely be marketed (and indeed celebrated) as if it were brand new technology. Whether the exact same Mac-version of Photo Booth is ported over to iOS or not, there will sure as sin be dozens of photo augmentation apps available once the developers are given the capacity to. 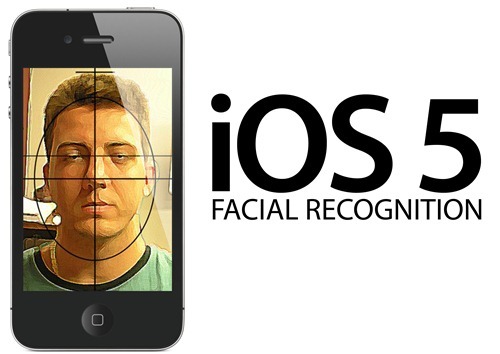 The only firsthand experience we have had thus far of facial recognition is through the jailbreak-only app RecognizeMe, which tries to give users that James Bond-like feature at the lockscreen of scanning the face and granting access only to authorized users. Unfortunately, despite the claims, the app doesn’t work very well for its rather hefty price of $6.99 (as a promotional price). The APIs are said to be “highly sophisticated,” and can locate mouth, left and right eyes in an image. The possibilities as to the extent of where this technology can go aren’t just limited to locating faces, though. Potentially, information could be gathered as to where a user is looking most within an app, and how engaged they are with certain content – useful for improvements as well as advertising. Furthermore, it could even go as far as to be able to detect frowns or smiles and surmise the emotional state of the user. We would certainly see more cracked-screen incidents if apps began insisting users to "cheer up!". While that is fantasy rather than reality, it will be interesting to see what the creative minds bring to the table with this new technology and how far it can go.